Retirement and Retirement Planning has a whole new face in the 21st Century. 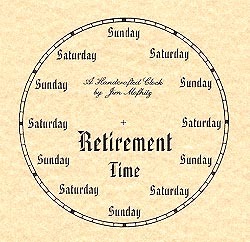 The traditional picture of retirement - gold watch, out to pasture, eternal vacation, golf 'till you drop is gone. Rocking chairs are giving-way to roller blades, as retirement takes on a new look and a new meaning. A new generation is redefining retirement as they approach it in better health, with more education and financial security. Instead of "retirement planning" the new words are re-tooling, re-positioning, re-creating, re-inventing, re-writing a lifestyle. Leaving the workforce is no longer leaving life. Leaving the workforce calls for a "time-out" to re-evaluate skills, interests, values, relationships and life purpose. All this is preparation for an energized re-entry into a second-half-of-life that is filled with purpose and passion. This"new retirement" calls for a new kind of approach. Part of that approach is a technology-based, Life Planning Program. This kind of training brings the best and brightest experts in the field of Life Planning to the participant's desktop. This approach allows these experts to be available 24/7, anywhere in the world - via e-mail, chat rooms, bulletin boards, e-newsletters, E-VideoCoaching®, TeleCoaching and E-VideoSeminars®. The TTG's Retirement Planning Program will offer participants an opportunity to take "time-out" - in order to examine the current quality of their lives. In addition, they will examine a future life-style that will be one of personal choice. They will be encouraged to carefully work through all the steps of making informed and confident decisions about their future. Program : Our state of the art retirement planning and older workforce strategy program. Benefits : Benefits and Issues of Retirement Planning for corporations and individuals. Resources : Some of the popular resources on planning the second half of life. ContactUs : Contact Us for more information on our retirement planning programs.